Engage The Culture! : Am I Really a False Teacher? Am I Really a False Teacher? In my book, Heaven’s Doors . . . Wider Than You Ever Believed! I share about a sad experience of having a dear friend who I had known well for over a dozen years come up to me at a conference to inform me that, in essence, he didn’t want to be my friend anymore. His reason? He had concluded that I am a false teacher who is leading people astray by my blog posts and a then-to-be published book addressing the issue of ultimate destinies. Neither my friend’s words nor the spirit in which they were communicated motivated me to change my beliefs. However, his words did make me think. Are Calvinists false teachers because their theological understanding of God’s sovereignty and grace differs from that of Arminians? Are Baptists heretics because they disagree with their Presbyterian friends about the mode or age at which people should be baptized? Are Charismatics really wolves in sheep’s clothing because they disagree with non-Charismatics about whether or not the gifts of the Spirit are relevant to life today? False teachers are deceptive in their dealings. It would seem reasonable from a quick look at the actual phrase itself to expect false teachers to teach something that is false. 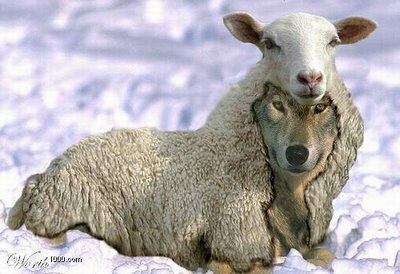 Peter pointed out that the false teachers he was referring to lied by exploiting others with “stories they have made up.” Wolves “who come to you in sheep’s clothing” are seeking to deceive those they are preying upon. In contrast, Calvinists and Arminians, Baptists and Presbyterians, and Charismatics and non-Charismatics who differ with one another do not generally lie to their followers about what Scripture actually says. Rather, they each look at the text and come to different conclusions. They definitely believe their theological opponents are mistaken, but they don’t usually see them as being deceitful. As a result, they don’t generally call each other heretics or false teachers. In my particular situation, it has been my goal to point out truth. In a former blog post for example, I noted that the original NIV translators inappropriately used the word “hell” to translate the Greek word “hades” in the parable of the Rich Man and Lazarus, and that those same translators never translated hades that way anywhere else in Scripture. I didn’t lie. I didn’t seek to deceive my readers. I stated the truth. And, in fact, the 2011 revision of the NIV actually corrected their error. False teachers are interested in profits. I have known – or known of – those within the religious community who have been motivated to a great degree by a desire to make money. Some have built large empires that later collapsed when fraudulent fundraising and accounting practices were exposed. My motivation for writing my book and blog posts has not been to get rich. In fact, I have lost far more money than what I have gained from what I have written so far. I was terminated from a ministry that I had worked with for over ten years after passing along a copy of my manuscript to the head of the ministry to let him know my thinking on the issue. False teachers pursue sensual pleasure. Major scandals have plagued the religious world in recent years involving well-known figures whose moral failures have brought disrepute on the gospel of Christ. My wife and I celebrated our 46th wedding anniversary this year. I have never been involved in an illicit affair. And, I can honestly say that I love and admire my wife more today than when we were first married. I honestly love my friend – and, yes, as far as I am concerned he is still my friend. I am honestly sad that he no longer wants to continue in fellowship with me. But, I am also honestly convinced that I am not a heretic, and that my friend does not really understand what actually constitutes a false teacher. Because someone disagrees with us on a theological issue doesn't automatically make that person a false teacher. We need to look at their lives. Are those we label as false teachers deceptive, or greedy, or immoral? If not, we should be very careful about labeling them that way. The views I have expressed on these blog posts and in my book are not new. In fact, much of what I have written has been an attempt to inform people in this generation of ideas that were held by the Christian Church in the earliest years of its existence – when it was closest to the Apostles, when its leaders read the New Testament in their native tongue, and its influence on the surrounding culture was the greatest. In essentials unity. In nonessentials liberty. In all things charity. We would do well to follow that advice today. "But, I am also honestly convinced that I am not a heretic, and that my friend does not really understand what actually constitutes a false teacher. " Let's pretend for the sake of the argument, that both parties are being HONEST. Your friend HONESTLY believes that you are a heretic. And you lost a friend over that disagreement. And we are reading all about it. Thank you for the note. Yes, my friend honestly believes I am a heretic and false teacher. My prayer is that he will see that we disagree on the teaching of Scripture on this issue, but that we are both seeking to know the truth. God bless. George - You have made the claim that the way God deals with man on the earth is how He deals with the unrepenant sinner in eternity. That is false. After many meetings with my former pastor and many discussions surrounding this subject he agreed that I was not a heretic in light of biblical teachings - however - I am a heretic in light of current "christian" culture. George, God has revealed in sripture that an unrepentant sinner when he dies will be forever damned. You reject this becaue you say that God is love, and no loving God would do that. You claim that since God is love and that He will continue to deal with the unrepentant sinner in hell and bring him to salvation an allow him to leave hell and go to heaven.. Scripture does not teach this though you think it does. ........... Question: What if it is really true that those who are in hell can never be saved? Would you want Jesus? Pat, it's not true! I know the heart of Jesus from Scripture, and He specifically says that He desires that all be saved and come to the knowledge of the truth. God is too holy to look upon sin . . . without doing something about it, namely loving it out of existence with harsh discipline if necessary. It is clear from your comments over the last several years that you desire to defend Scripture and God's character. However, you don't really know His heart. He loves you, and He loves each and every person He created. And like a good Father, He will do what is in the best interests of each one of His children - He will ultimately get them into His eternal presence. Pat, the ultimate answer to all questions of faith lies in the character of God. I trust Him, and know that He is good and whatever He does is good. So, in answer to your question, I would want Jesus no matter what. God bless. Thank you for answering George. For me I would say no. I would not want Jesus under those circumstances. I guess I sounds too much like the protection money paid to gangsters for me to accept it. Luckily God/Jesus is no Godfather. Annymous - Have you ever been convicted in your heart that you are a sinner, that Jesus Christ died for your sins so you could be forgiven and have eternal life? Have tou ever asked Jesus to save you, to forgive you of your sins and to come live in your heart? Yes, I have. Pat, the only thing I'm saying that disagrees with much of what you believe is that natural death does not mark the end of when God works in a person's life to bring the person to faith. God's grace continues into the ages to come. George, My last post was addressed to 'Anonymous' and not you. I know that you are truly born-again. That I have no doubt about. Hebrews 11:39-40 makes it clear that perfection is our universal destination and that progress towards perfection may be a cooperative effort between those in the spiritual realm and ourselves in the physical realm. "All these though well attested by their faith, received not the promise that apart from us they should not be made perfect." Paul's warning in 2 Corinthians 3 seems to be often ignored. "We are made able ministers of a new testament, known and read of all men, written on the fleshly tablets of the heart by the Spirit of the Living God, not on tablets of stone because the letter kills but the Spirit gives life." Jesus is the Word of God, scripture introduces us to Him. We are to hear and obey Him. "My sheep hear My voice and I know them and they follow Me."